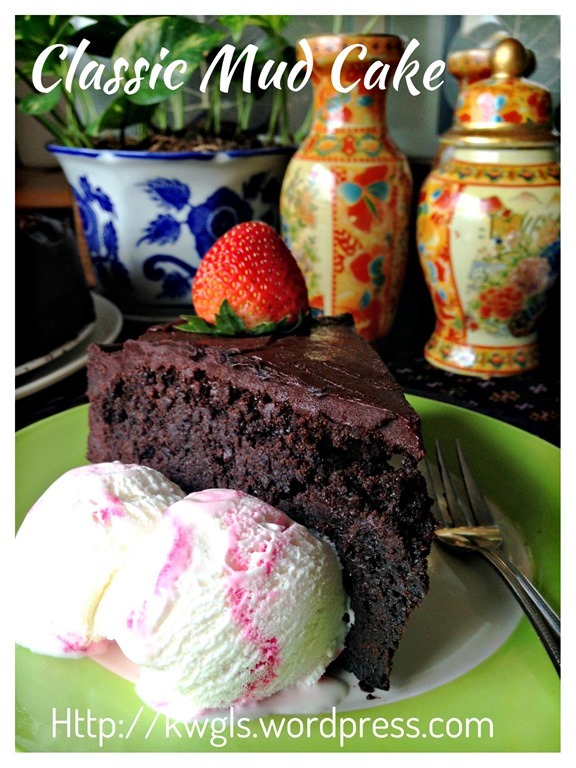 This is not a cake for those who are health conscious…Haha. Am I slamming my own face ? 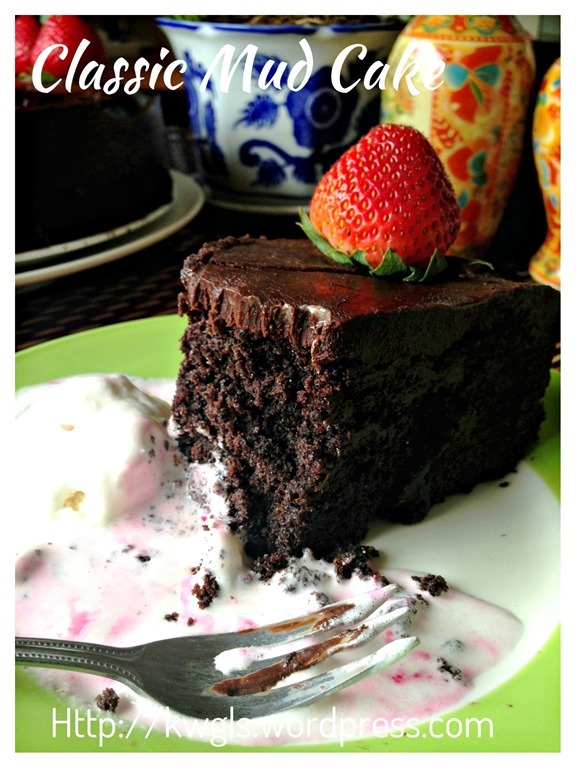 Well, there are times when one have urges for sweet bakes and this is one of the classic desserts that I usually ordered when I dined in Western restaurants.. 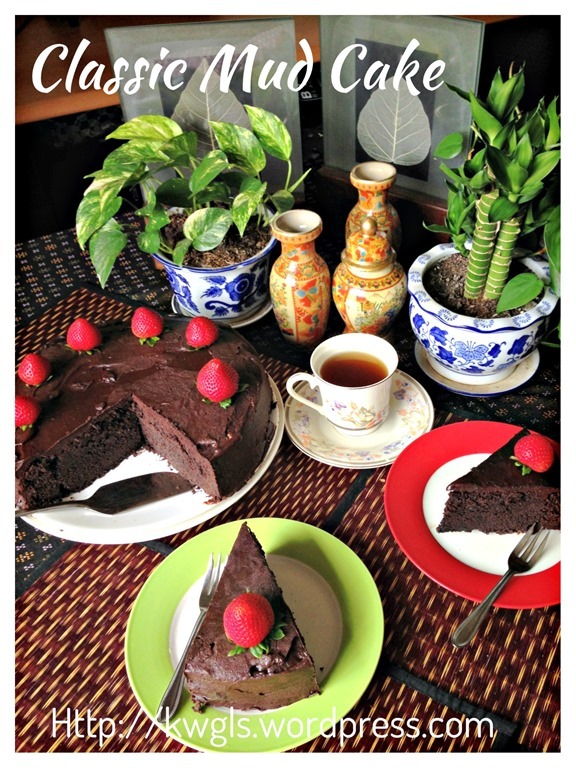 I never expect the cake to be so big, one of the biggest cake that I have prepared..unless you have lots of friends to share, I would advise readers to half the recipe…It is unlikely most Asian foodies will be able to finish the entire cake for a typical household of 4 members. 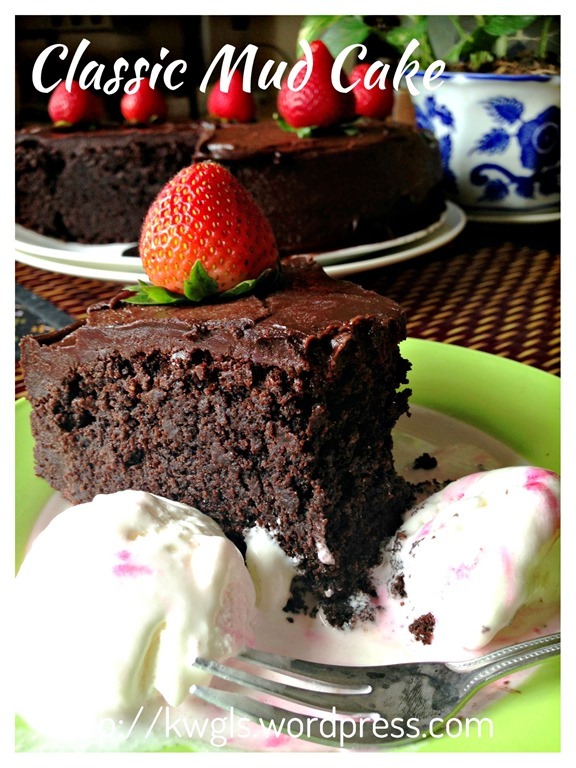 The difference between normal chocolate cake and mud cake or some called Mississippi mud pie is that the cake is much richer and denser than the normal chocolate sponge cake. It is a bit gooey in the centre and usually served with thickened cream or ice cream. It get its name possibly because it resembles the mud by the Mississippi River bank..
Lightly beaten the eggs with the milk or buttermilk. Set aside for later use. Melt the chocolate, butter, instant espresso and the water in a pan. Set aside for later use. 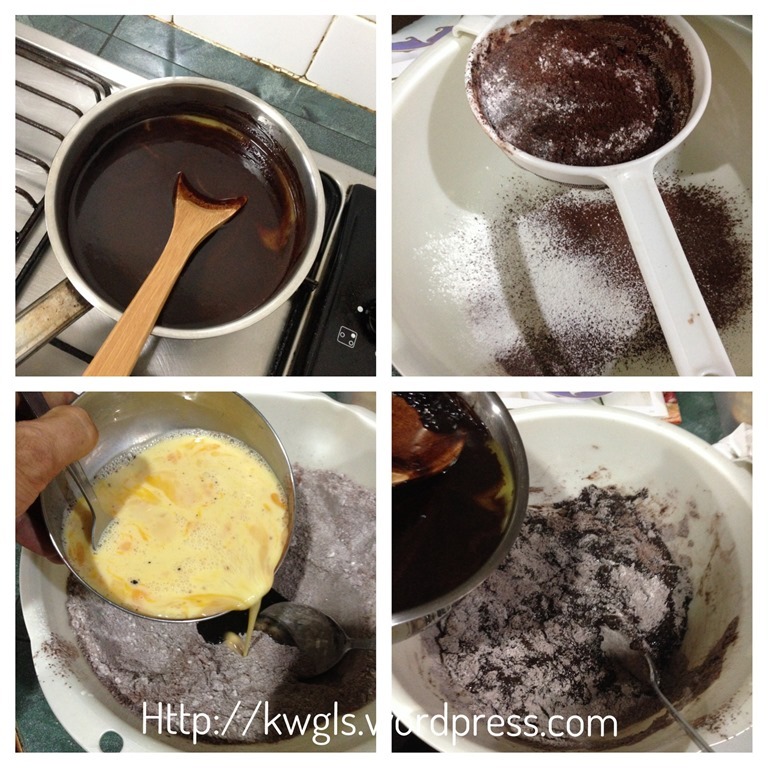 In a big mixing bowl, sift the plain flour, self raising flour, baking soda and cocoa powder. Add in the sugar and make a well in the centre. Add the combined eggs mixture and oil, slowly stir in the chocolate mixture until well combined. 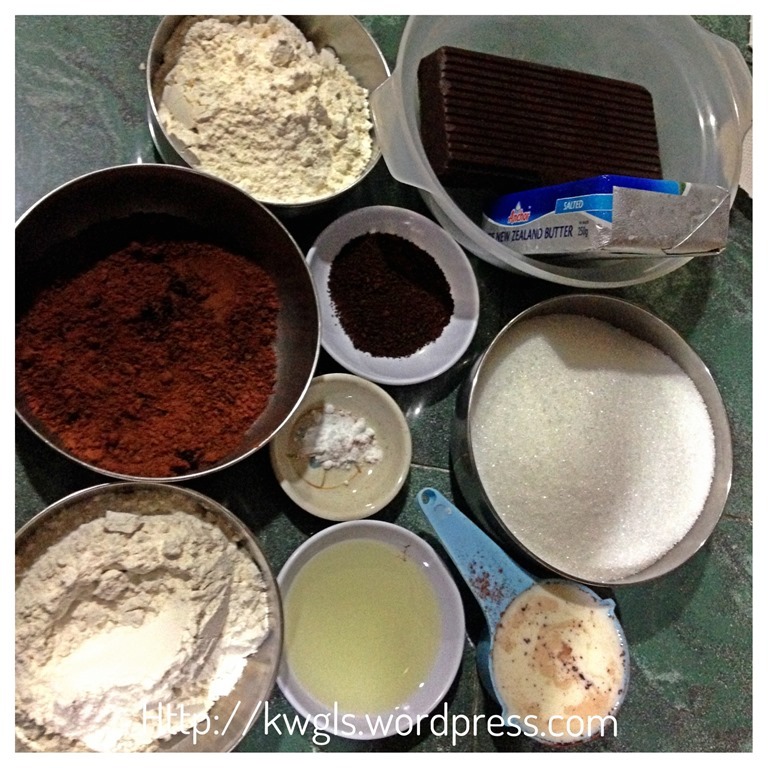 Transfer the mixture into the greased round baking tin. Bake in the pre-heated oven of 160 degree Celsius for 1 hour – 1 hour 15 minutes or until a skewer inserted in the centre of the cake comes out clean. Cool completely in the tin before remove from the baking tin. Extend the baking time if it is still too soft in the centre. 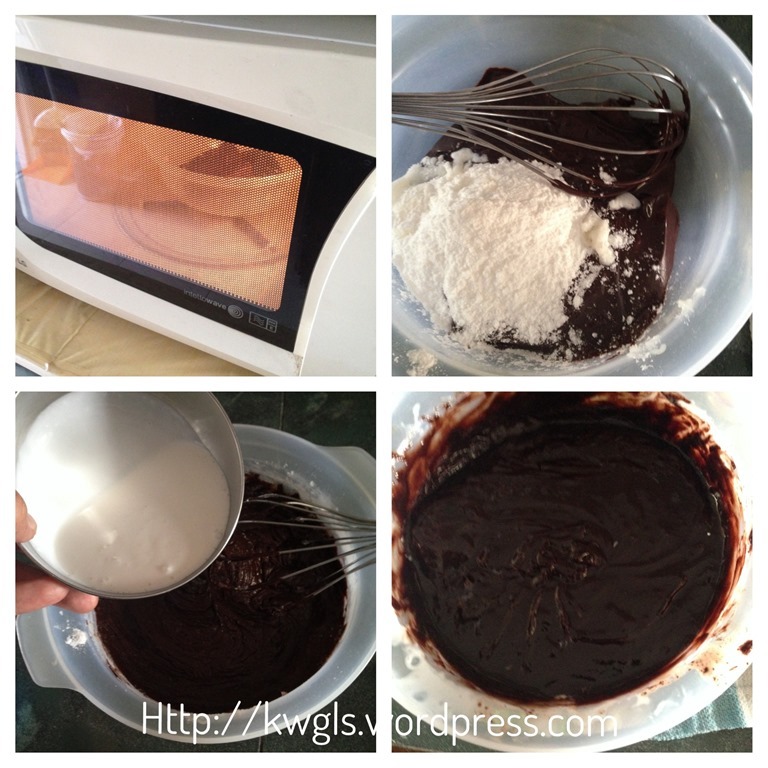 To prepare the glaze, heat the chocolate in a microwave bowl for 45 seconds to 1 minutes. Take out, add icing sugar and fresh cream, stir until well combined. If you do not have a microwave, you can always heat these 3 ingredients over a pot of hot water and stir until the chocolate melted. Pour the glaze over the completely cooled cake making sure the sides are adequately covered. 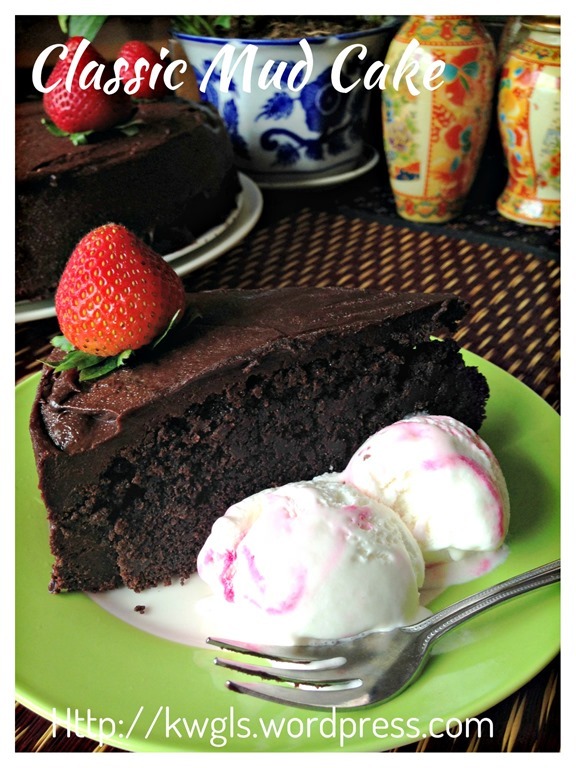 Best served with some some ice cream or additional chocolate sauce or thicken cream. 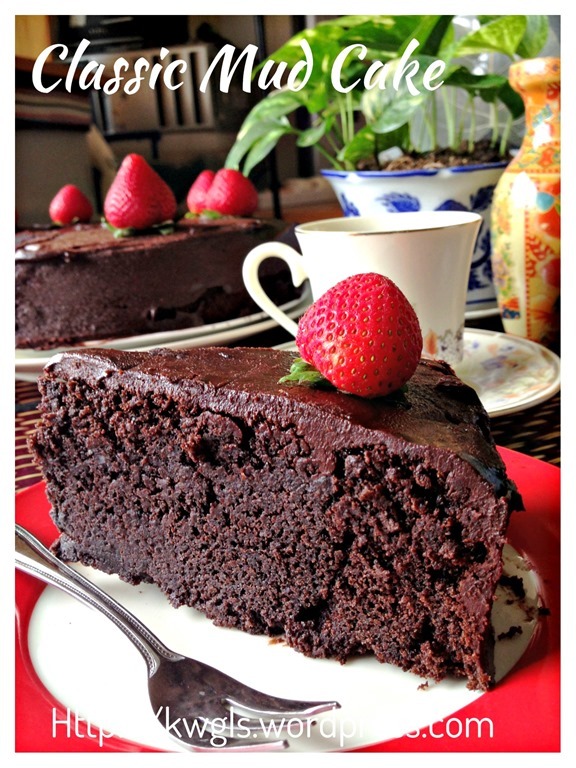 Not a difficult recipe but a classic and rich chocolate cake recipe. 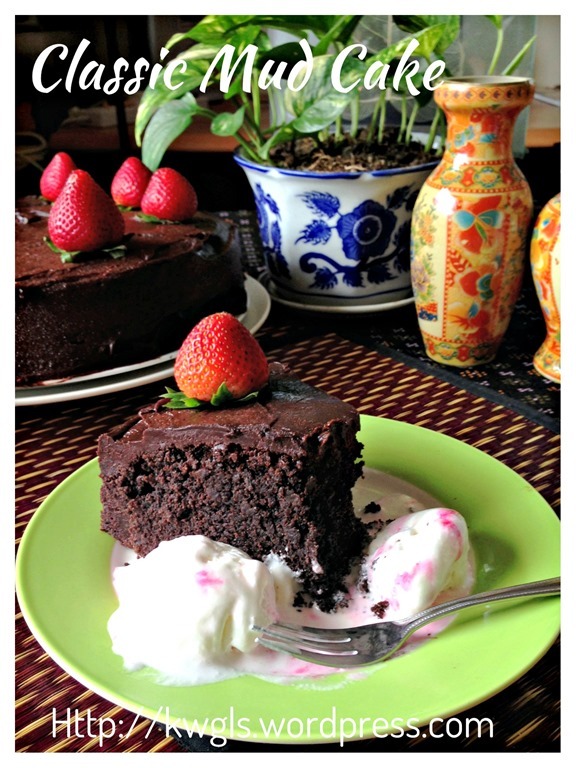 It is definitely a presentable bake when you have house guests…Hope you will give it a try. 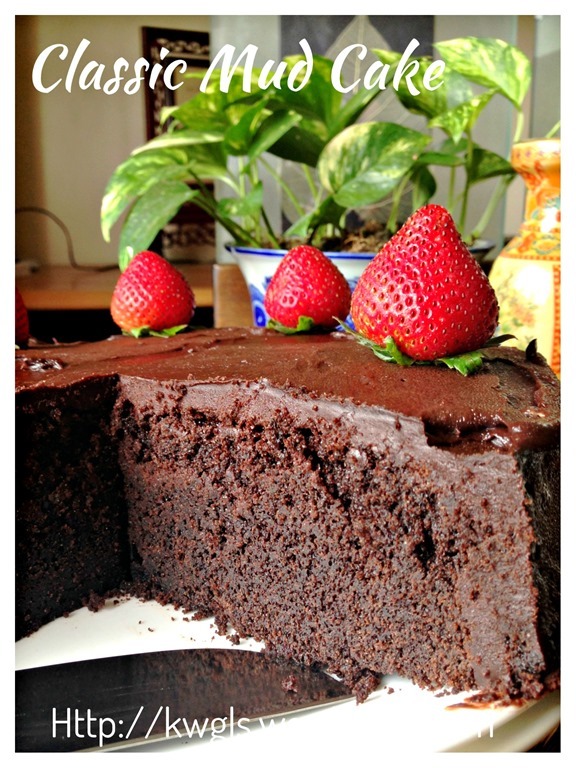 This entry was posted in Cakes and cookies, Food Preparation Series and tagged 8, chocolate mud cake, chocolate mud pie, GUAI SHU SHU, Guaishushu, kenneth goh, mississipi mud pie, postaday, 巧克力泥浆蛋糕. Bookmark the permalink. This looks delicious. 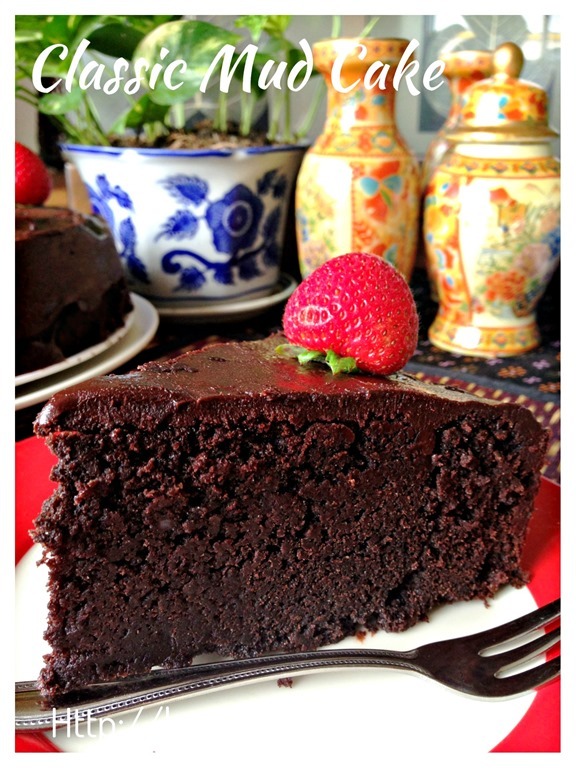 I love dense and rich chocolate cakes I can’t wait to try it (I just have to find people to share it with). I’m pinning this. 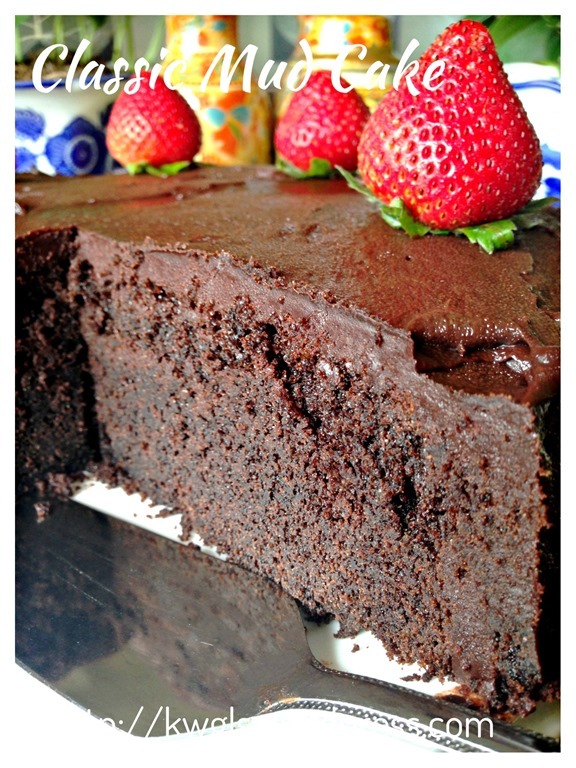 i can never go past a good chocolate mudcake.. so craving a slice right now! yum! OMG !!!! I like it…. 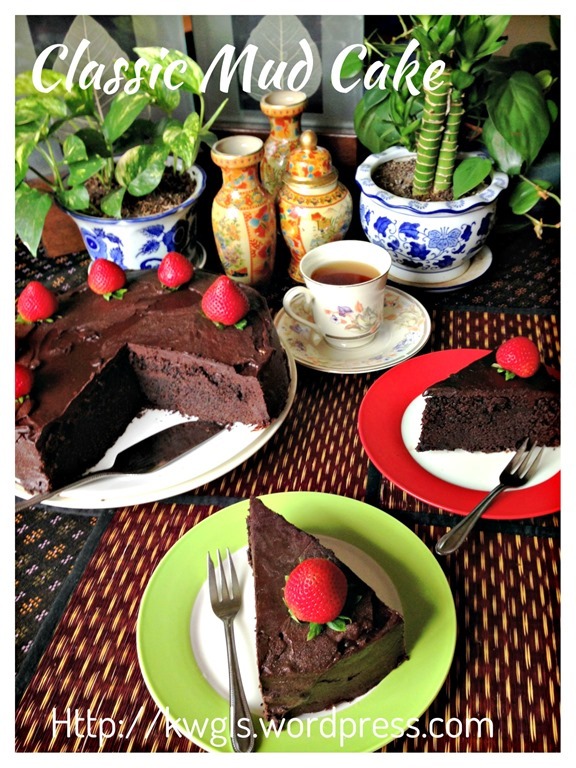 Kenneth, I baked this cake last week and son (and friends) said it was delicious :-). While the taste was great, there was a hard crust on top of cake. So, the cake was crispy on top and soft below (about 0.3inches below). I believe it is due to the temperature of my oven. What do you think should be improved? Looking forward to your advice. Thanks. 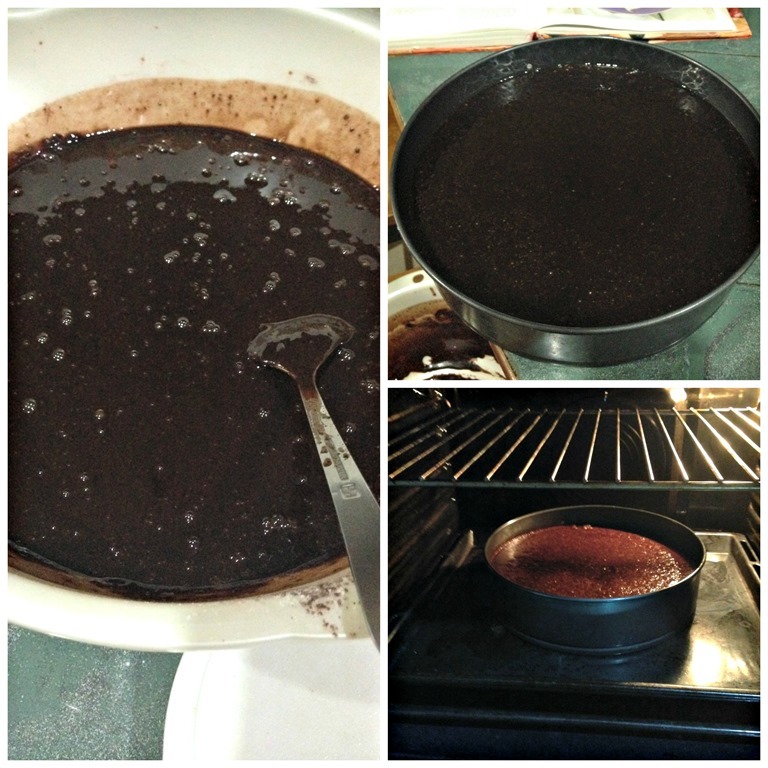 Hi Kenneth, I would like to try your chocolate mud cake using my bundt cake tin mould. My worry is: will the cake be difficult to unmould from the bundt tin? (Stuck cos cake is dense) Kindly advice. Thank you. This cake should be easier to slice than soft fluffy cake..